Indiana Jones might hate them, but snakes like Otto in Willow the Vampire and the Sacred Grove are not nearly as threatening as they seem and they are certainly not slimy either. I shall be eternally grateful to my old school teacher at primary school who invited a variety of people into our school to introduce us to their unusual pets and small animals kept in zoos. Among them was a man who looked after a number of snakes. As a child I believed – like many people – snakes had slimy skin with which they slithered on the ground like a snail or slug. When the nice gentleman from the zoo exhibited a variety of snakes in our classroom, the bravest among us were allowed to touch the snakes and, not wishing to appear a wimp, I volunteered to stroke the snake he offered us. Naturally, the snake’s skin wasn’t slimy at all and actually rather beautiful. Boa constrictor snakes like Otto have fine, granular scales. Scales on a snake are not separate things but are simply a thickened part of their skin and are therefore connected to it. Some snakes have rather novel ideas about protecting themselves from being disturbed by intruders. I’m not sure what tactics Otto the snake usually employs when he wants to be left alone for a peaceful slumber by the hearth, but the European grass snake for example just rolls on its back with its mouth wide open and plays dead to prevent predators from taking a lively interest in its fleshy parts. Some snakes pretend to be nastier than their bite by mimicking the bright colours of really poisonous snakes. Snakes don’t have legs, so they can’t just pick up their chins and run off. Their skeletons consist of little more than a skull and one very long backbone to which hundreds of curved ribs are joined. The snake’s jaw is loosely connected, which enables it to stretch enormously, when swallowing prey whole. When snakes go for a swim, they wriggle from side to side, propelling themselves forward in that way. Among the 2,700 types of snakes only 300 of them can actually kill people. Less than a quarter of all snakes are poisonous, but some are really good wrestlers who can strangle their prey. 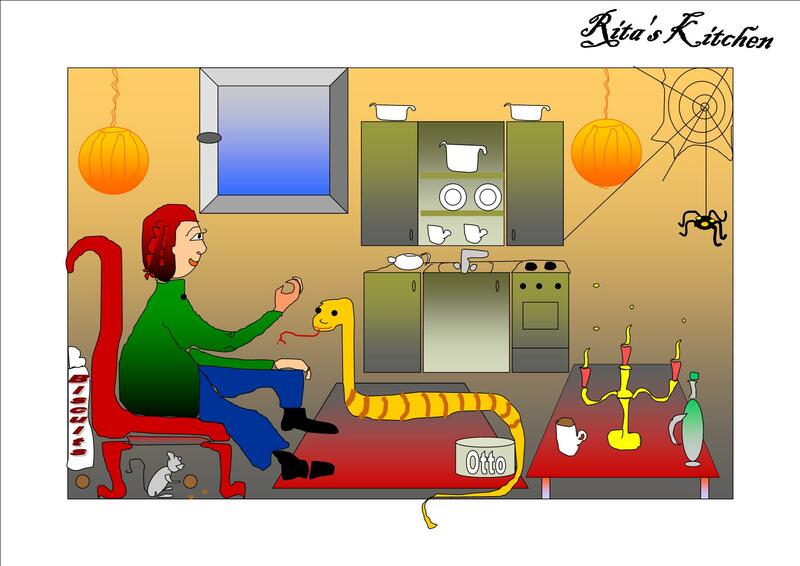 Snakes live in all sorts of habitats, except where it’s really cold – think Otto and his place by the warm hearth! Some snakes are tiny and would fit into the palm of my hand, while others – like Otto – can grow to lengths of 10 meters, large enough to eat a whole crocodile for breakfast. In fact, boas can eat prey 5 times their own diameter thanks to their kinetic jaws. Their teeth are curved and, by first moving prey to one side with their teeth and then to the other, the boa can eventually push large prey down into its throat. Curiously, snakes don’t need to eat very often and can survive without breakfast, lunch or dinner for quite a number of months before they feel peckish again. Boas are arboreal, which means they live mostly in trees. Boa constrictors like Otto can swallow a large rat whole, but they typically squeeze the life out of their victims first. Female snakes are usually bigger than male ones, so we’ll see if Otto meets his match in Willow’s forthcoming adventure (Willow the Vampire and the Würzburg Ghosts). I am terrified of snakes and found a European grass snake once. It was dead (you can see a clou coming here), so I picked it up and threw it into the bonfire we had going on. When I learned about snakes playing dead, it fueled my fear, as I’m now afraid I might be haunted by burning snake ghosts.